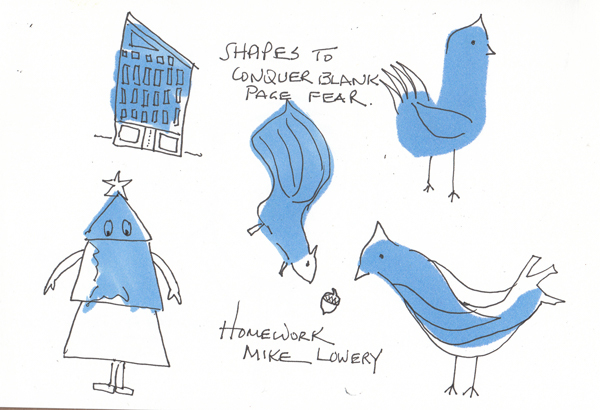 Mike Lowery, graphic designer and Children's Book Illustrator, was the artist teacher for week 2 of Whimsical. He did several demos online, and after each one he suggested that we try the same techniques. Shapes His lifetime goal is to draw for 30 minutes every day, and when he stares at the blank white page, with no ideas, he uses a fat marker to make shapes, and then draws around them. These are mine. I loved this 5-10 minute exercise! I know that the Christmas Tree costume would never originate in my imagination except through an exercise like this. Portraits: Mike was drawing Richard Owen, the man who created the name "dinosaur," for a children's book on dinosaurs. He used an actual photo and simplified the portrait to match the style of his illustrations. 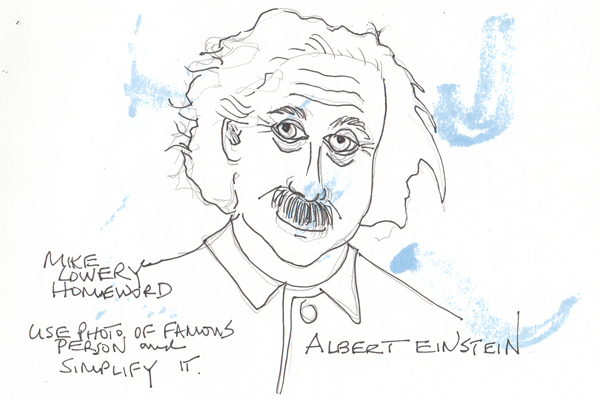 I used a photo of Albert Einstein for my simplified drawing. The blue color is due to marker leakage through to this next page in my sketchbook. Developing a Story Character: Mike was developing an animal character for a special project and showed us how he created a duck named Carl The Duck. It took many steps and drawings for him to develop a duck with personality. 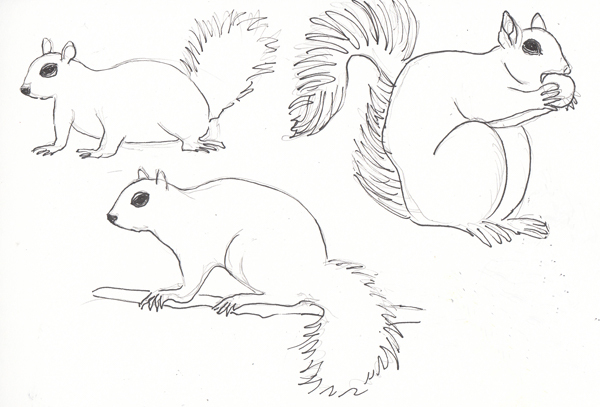 This is my first iteration of a character - a squirrel - still to be worked on to develop a squirrel with personality. If I don't ever arrive there, I wanted to post step 1. Icons: Mike showed us pages of icons he developed, and for our homework asked us to develop a page of icons - 10, 20, or even 150. I chose to draw my favorite kitchen tools, even though I really need experience drawing icons for cars and taxis - to feel more confident about adding them to urban sketches of NYC. I enrolled in another multiteacher Sketchbook Skool class (Whimsical) and watched the new class each week for 5 weeks. But I didn't have time to do the homework then and just now restarted the online class. Rebecca Green, a children's book author, asked us to either draw a character from a favorite book, or illustrate a scene from a book. I love Paris and follow a series of Paris mysteries by Cara Black. I just finished one and decided to draw my vision of the main character - Aimee Leduc. She owns a cyber security firm, but regularly becomes a private investigator. 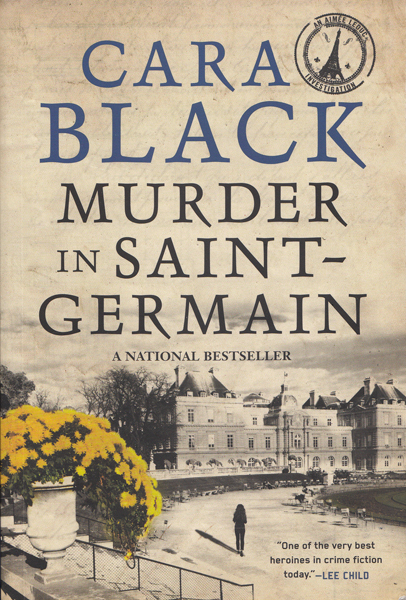 Cara Black's Book: Murder in Saint-Germaine. 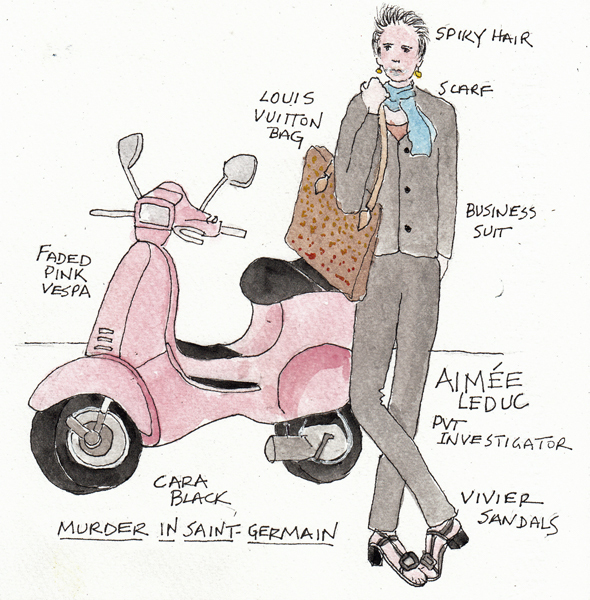 Cara Black sets her stories in individual arrondisements of Paris, and Aimee lives on Ile St. Louis and travels the city on her "faded" pink Vespa. Drawing from observation is so much easier for me than drawing from my imagination. I'm hoping that these illustrators help me improve my skills so I can eventually make a short book about my imaginary characters Axel and Alice for my grandchildren. 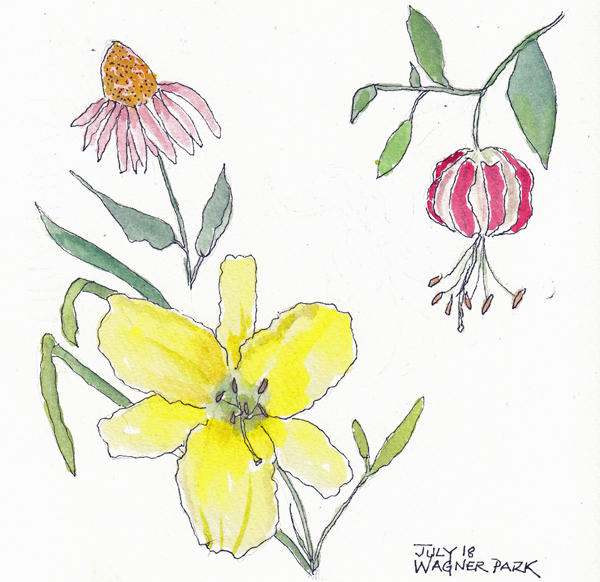 I sketched flowers at Wagner Park last week, but didn't finish painting them until this week. Every week the blooming flowers change, and I try to capture them in my sketchbook. I love having a sketchbook with the paper I like, in a size that I prefer, and started making case-bound sketchbooks 10 years ago. I made a new daily sketchbook this week, using the same method I've used for several years. It was made with 2 sheets of Fabriano Artistico 140 lb Soft Press paper. 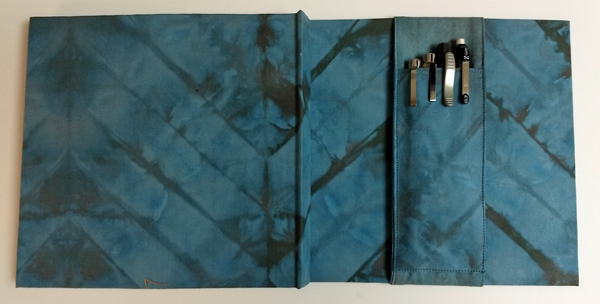 The cover was made using bookcloth from dyed cotton fabric. 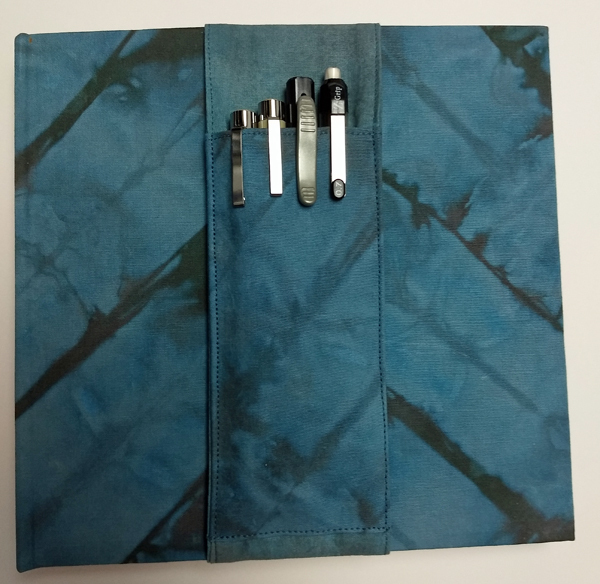 On the front of the book is a new Pen Pocket made just for this book. 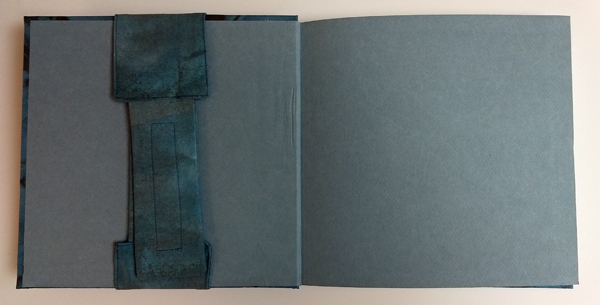 The inside of the book, showing the end papers and the back of the pen pocket. I posted a technique that I'm exploring for figure drawing, and the method is outlined briefly in the last blog post. Those drawings were done from photos. 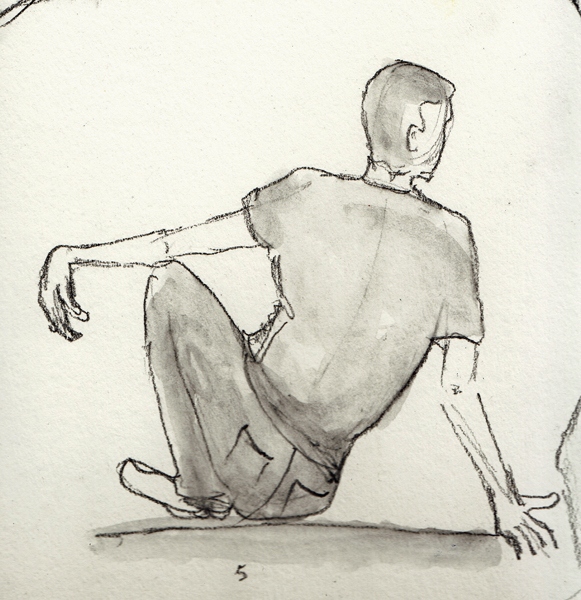 Figure drawing, using this quickly drawn frame, was done from live models last Wednesday at Battery Park City. These are two 1 minute drawings from the 20 that we did for warm up. These poses might have been harder for me to draw in 1 min without my line of action structure. You can see the quick lines drawn first. 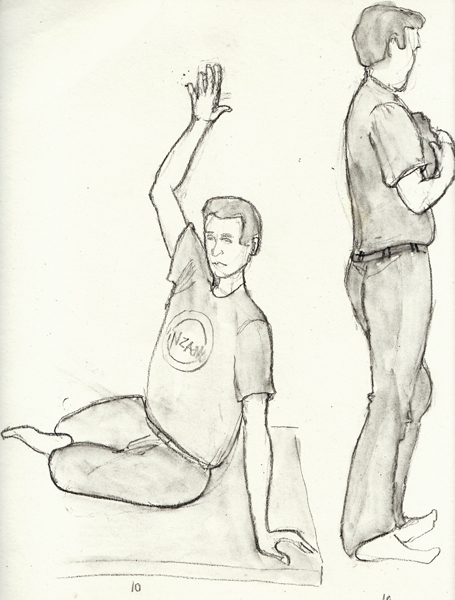 This was one of the four five minute sketches, and you can see a few of the lines of action in this pose. 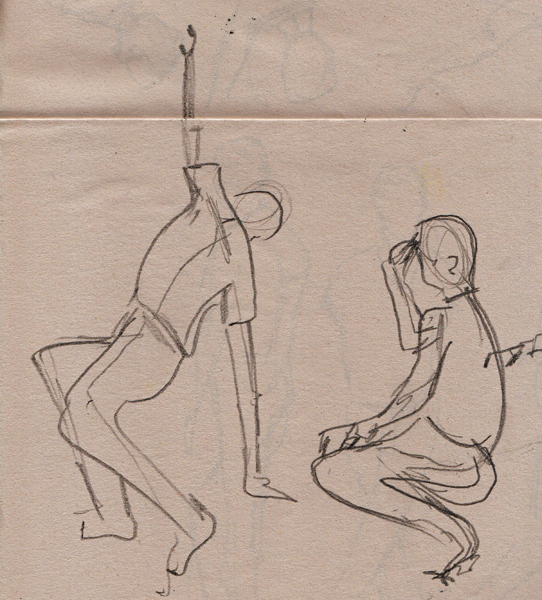 These are two 10 minute poses using the same system. 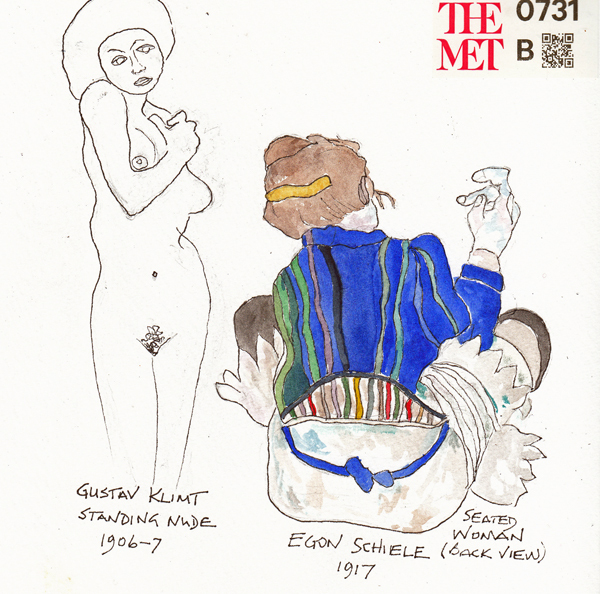 The five and 10 minute poses were drawn with a General Sketch and Wash pencil, and then a waterbrush was used to spread the graphite for the gray tones.